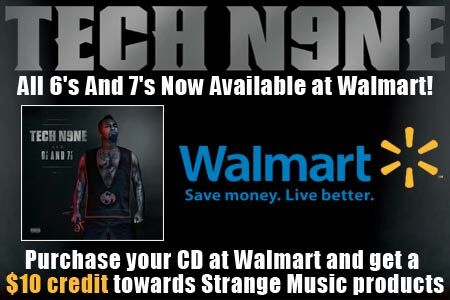 Tech N9ne’s monumental album All 6’s and 7’s is now available in a clean version at Wal-Mart. Those who purchase the clean version from Wal-Mart will receive $10 in Strange Bucks redeemable for merchandise at www.strangemusicinc.net. Featuring the singles “He’s A Mental Giant”, “Worldwide Choppers”, and “Mama Nem”, this is an album that can’t be missed. Go to Wal-Mart and get your copy today!